Money Menagerie The History of Money Funny Money Money is Art! 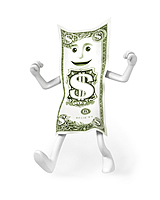 Fun facts and everything else you want to know about money! The MegaPenny project is to help students visualize large numbers using pennies. The hands of the clock in the steeple of Independence Hall on the reverse of the $100 Federal Reserve Note are set at approximately 4:10. A mile of pennies laid out is $844.80. By this standard, America is about $2.5 million wide, coast to coast. The approximate weight of a currency note, regardless of denomination is one gram. There are 454 grams in one pound; therefore, it takes 454 notes to make one pound. A million $1 bills weigh 2,200 pounds. A $1 bill is 0.004375-inch thick. If you placed 1 million of them in a neat square, it would measure about four feet tall, four feet wide and four feet thick. A stack of currency one-mile high would contain more than 14 million notes. A stack of bills destroyed in a single year would measure 200 miles high. Mt. Everest, the tallest mountain on Earth, is a mere 19,035 feet, or slightly more than 3 miles high. Most people won't bend over to pick up money lying on the sidewalk unless it's at least a dollar. Let's flip a coin and try to guess whether it will come up heads or tails. Three times as many people guess 'heads' than 'tails'. 65% of Americans would live on a deserted island all by themselves for an entire year for $1,000,000. A person who drives 10 miles to buy a lottery ticket is 3 times more likely to be killed in a car accident while driving to buy the ticket… than… he is to win the jackpot. The average wedding in America costs a staggering $20,000.00. People tip more on sunny days than they do on dreary days. More than 80,000,000 people call the I.R.S. Information Hotline phone number every year. One-third of those calls go unanswered. And, according to the Treasury Department itself, 47% of the answers the 'get-through' callers receive are incorrect. Currency in circulation before 1929 measured 3.125 inches by 7.4218 inches. In 1929, the size was changed to its current measurement of 2.61 inches wide by 6.14 inches long. Did you know that a quarter has 119 grooves around the edge, and a dime has 118? Do you know the purpose of the ridges on the edges of coins? Without ridges, it is possible to scrape metal off coins without it being obvious. In the days when coins were made of silver or gold, a person could have made a good, but illegal, living from shaving coins and selling the precious metal. During much of the 17th and 18th centuries, the Spanish dollar coin was the unofficial national currency of the American colonies. To make change, the dollar was actually cut into eight pieces or "bits." Thus, came the terms "pieces of eight" from these early times and "two bits" (a quarter) from recent times. The bison on the Buffalo Nickel was from New York City. Named Black Diamond, this bison lived around the turn of the 20th century in the Central Park Zoo. Coins usually survive in circulation for about 30 years. The origin of the dollar sign — $ — has various explanations. Perhaps the most widely accepted is that it is the result of the evolution of the Mexican or Spanish "P's" for pesos. This theory, derived from a study of old manuscripts, explains that the S gradually came to be written over the P, developing a close equivalent to the $ mark. It was widely used even before the adoption of the United States dollar in 1785. How big is a trillion dollars? Try relating each dollar to one second. A million seconds = just under 12 years. A billion seconds = about 32 years. A trillion seconds = 32,000 years. History - Long ago Roman soldiers were given a lump of salt for their wages. This is in fact where the word “salary” comes from. History - Around 1900, people on the Yap Island in the Pacific Ocean used giant stones with a hole in the middles as money. Some stones were as heavy as a small car. Money Menagerie - Since money gets dirty with use, many Japanese automated teller machines will heat their bills to 392 degrees F to kill bacteria. On April 2, 1792, Congress created the U. S. Mint. A month later, land was purchased for its construction in Philadelphia, which was then the nation's capital. What happens if your money gets trashed? The Office of Currency Standards will replace it if you can present to officials 51 percent of the note. 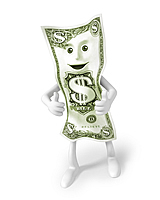 If your cash has been burned, torn or otherwise destroyed, they will help you verify and replace that money. The office once received a shotgun in which a man had hidden some money, but forgot and fired the gun. In another case, a farmer sent his cow's stomach stuffed with money. A Cowboy from Laramie , Wyoming , walked into a bank in New York City and asked for the loan officer. He told the loan officer that he was going to Paris for an international rodeo for two weeks and needed to borrow $5,000 and that he was not a depositor of the bank. The bank officer told him that the bank would need some form of security for the loan, so the Cowboy handed over the keys to a new Ferrari. The car was parked on the street in front of the bank. The Cowboy produced the title and everything checked out. The loan officer agreed to hold the car as collateral for the loan and apologized for having to charge 12% interest. Later, the bank's president and its officers all enjoyed a good laugh at the Cowboy from Wyoming for using a $250,000 Ferrari as collateral for a $5,000 loan. An employee of the bank then drove the Ferrari into the bank's private underground garage and parked it. Two weeks later, the Cowboy returned, repaid the $5,000 and the interest of $23.07. The loan officer said, "Sir, we are very happy to have had your business, and this transaction has worked out very nicely, but we are a little puzzled. While you were away, we checked you out on Dunn & Bradstreet and found that you are a highly sophisticated investor and multimillionaire with real estate and financial interests all over the world. Your investments include a large number of wind turbines around Laramie , Wyoming . What puzzles us is - why would you bother to borrow $5,000?" The good 'ole Wyoming boy replied, "Where else in New York City can I park my car for two weeks for only $23.07 and expect it to be there when I return?" The pyramid you see on the back of your currency is actually the reverse side of the Great Seal of the United States. The pyramid represents strength and permanence and has been left unfinished to signify the future growth of the country. Contrary to popular belief, the automobile pictured on the back of the $10 note is not a Model T Ford. It is a drawing by the person who designed the bill. The vignette on the back of the $100 note is Independence Hall in Philadelphia. There are three people depicted in the engraving. A man and a woman are in front of the hall close to the building; the third person is a man pictured looking toward the building. The hands of the clock on the back of the $100 bill are set at approximately 4:10. Although the time is not readily identifiable to the naked eye, it can be seen when examined with 20-fold magnification. There are no records explaining why that particular time was chosen. During the Civil War, the Bureau of Engraving and Printing was called upon to print paper notes in denominations of 3 cents, 5 cents, 10 cents, 25 cents and 50 cents. The reason for this is that people hoarded coins, which created a drastic shortage. These bills, called greenbacks, were used to pay Civil War soldiers. Martha Washington is the only woman whose portrait has appeared on a U.S. currency note. It appeared on the face of the $1 Silver Certificate of 1886 and 1891, and the back of the $1 Silver Certificate of 1896. There have not been any women featured on U.S. paper currency in the entire 20th century.